Wellington Mayor Kerry Prendergast has welcomed the Environment Court’s decision, released today, that gives the go-ahead for the redevelopment of the Overseas Passenger Terminal (OPT) on Wellington’s waterfront. Mayor Prendergast says the OPT redevelopment would mean the Council is not faced with the bill for the upgrade of the terminal and the wharf it’s built on. Wellington Waterfront Ltd, a Council-controlled organisation, negotiated a $32 million deal in which Willis Bond & Co would pay for a 125-year lease on the wharf and terminal building. Under the company’s proposal the building would accommodate apartments on the upper levels and a range of other uses at wharf-level. The wharf would remain a public space with access to everyone. Willis Bond & Co would spend some $16 million on repiling and strengthening the 101-year-old wharf on which the OPT sits. Wellington Waterfront Ltd would receive some $16 million in cash and development benefits and improvements. The improvements would include a water-level fishing wharf extension at the seaward end of the terminal, accommodation within the terminal of space for an artist-in-residence, and an upgraded public viewing platform at mezzanine level. Mayor Prendergast says the upgrade will turn the OPT into “what it was originally meant to be – a destination”. And goes on in that vein. Worth checking out for the full info. So, what do you think of that decision? Come to think of it, what do I think of it? Hmmm, I’m not so sure. On the one hand its a great move for common sense, as well as for Willis Bond and Athfield Architects – and saves the Council a lot of money from having to upgrade the wharf for no return. That was one helluva well-timed swim under the wharves with Mr Pike, wasn’t it Mayor Prendergast? If the Environment Court were wavering at all at that point, I’m sure that put them back on the straight path. It is a calamitous body blow for Waterfront Watch, with the Mayor calling their appeal against the OPT redevelopment a “spurious and ill-conceived appeal” – and, with the new, nasty, take no prisoners National government in place, that probably spells the death of public pressure groups from ever taking on subjects like this again. With the government’s Amendment to the RMA (“Streamlining and Slaughtering”?) Bill (itself possibly deserving of the title “spurious and ill-conceived”), and the proposed new massive increase in costs, it’s unlikely that Pauline Swann and her band of elderly masked Avengers will ever ride forth on their pensioner tricycles again. And, all jesting and jousting aside, that’s a sad thing. Swann should be given a medal for standing up to the bullies at the Council and saying what she believes in. She and Lindsay Shelton, almost single handedly, stopped the Hilton dead in its tracks (massive shout out to the Civic Trust massive as well, of course – Respect to the Seniors! ), and we haven’t really seen a mass outpouring of grief about that – except, quite possibly, in the WWL offices when they realised that they would have to pay for the wharf repairs on their own. Swann also has her off days – she (and the Waterfront Watch crew) also argued against the development of the Kumutoto area, and that now appears to be a well respected part of Wellington city. She protested heavily against the Council’s choice for Waitangi Park, still muttering for years afterwards that it was all a Council stack up job. But as a concerned Wellingtonian, pushing for the greater good of Wellingtonians everywhere, she deserves a gong. And, as we noted in an earlier post, she’s probably more likely to ever get one than any polo-necked local architect. But, as always, there is another side to the story, and we shouldn’t let Kerry get her own way with the media spin-doctoring. “Mayor Prendergast says the upgrade will turn the OPT into “what it was originally meant to be – a destination”. Oh please, Kerry, just how gullible do you think we all are? What a load of absolute cobblers. It is a proposal for a set of extremely upmarket apartments for rich and wealthy yuppies, dinkies, and most of all, wealthy oldies keen on spending their kids inheritance. Oh, and with a little deck for fishing stuck on the end, where the poor and the hungry can go and cast a line into the water in the hope of pulling up a lonely sprat or two. It’s not going to be a “destination” at all. Yes, I’ll give you that it hardly is a destination at all at present, and in a way, anything would be preferable to the current rust-ridden shed full of fake kashmiri rug-sales, italian pot-fares, bogus maritime clothing sales, saggy, baggy women’s knickers, and other generally run down, end of line, tawdry crap for sale. It is a destination just for tat and rat at present, but at least it is some form of destination. Once it is given over to the private sector for housing, that’s all it will really be: a rather nice housing area for rich people out on the water. And there’s nothing inherently wrong with that – rich people have to live somewhere, and who wouldn’t want to live out on the water, with the sea lapping round your metaphorical ankles? But why not just come out and say that, instead of trying to hide behind the well-spun fabric of PR tosh? I think it can be genuinely said that the new OPT could be a ‘destination’. Although theres nothing especially unique about the proposed site (apart from a nice view and maybe some fishing), this same fact also holds true for much of the waterfront. This doesnt stop these places from being great public spaces. If there is going to be a private use of the OPT site (which is pretty much mandatory given the outsanding costs) then apartment housing is probably one of the better ones, especially given that the scheme appropriately reserves the ground floor for retail of the presumably pedestrian attracting/utilising kind. Why are the rich-apartment-yuppie-pricks at the OPT any less a hindrance to the quality of the public space than a price-gouging-colluisonist-energy-company was at Kumototo? Kumoto is a success because of the quality/execution of the design, and a great set of ground-floor tenants. I dont see any reason why the OPT couldnt emulate this. Of course she’s going to say that sort of codswallop – you never expected the truth did you? I take mild umbrage at the “spending the children’s inheritance” as I agree with Martin Hawes in that the cheque to the undertaker should bounce. If one’s children are ready to face the world then that IS their inheritance, I think. 60 – quite – take as much umbrage as you want, we’ve stacks of the stuff sitting in boxes around the room any way. Never quite knew what it was for…. I think I shall buy the penthouse at the end of the OPT, and hold weekly parties with all sorts of shenanigans going on, such as dwarfs with cocaine, naked samba dancers, and a whole section of exotic fish. WooHoo! (but only if I do have the disposable income of Freddie Mercury). 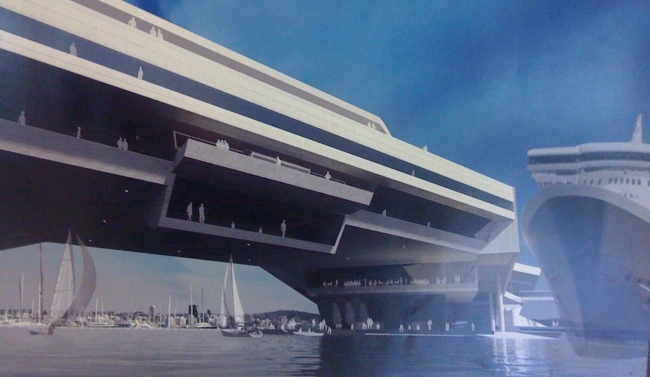 “The improvements would include a water-level fishing wharf extension at the seaward end of the terminal, accommodation within the terminal of space for an artist-in-residence, and an upgraded public viewing platform at mezzanine level.” which doesn’t sound like much of a destination to me. A fishing wharf – good, but hardly a big deal. An artist in residence – not a public destination. And a viewing platform at mezzanine level – ie not very high, and i suspect, not really much of a destination either. There’s a nasty habit with “public areas” in mostly private buildings to get colonised and taken over back into the private realm. I’m sure this won’t happen here – but it has happened before, very close by. The Herd St Post Office redevelopment into apartments has public use on the ground floor – hooray! – but how many people are aware that part of the Resource Consent process was an agreement for a top floor public lookout area? It was, I believe, legally mandated, but every time I’ve been there there has been no access. Possibly it is open between 9am to 5pm – but it does not seem to be available in the hours of darkness or the weekend. But of course I hadn’t picked up on the part that says “apartments on the upper levels and a range of other uses at wharf-level.” ie possible continuous wall to wall restaurants and bars around the ground floor. Actually, that’s more likely to be the reinstatement of the current boatie type shops for a large part of it i think – which is good, but again, not that much of a change from the present ‘destination’. But yes, you’re right, we should give them the benefit of the doubt. And hold them to that very strongly…. A mix of both, unless it’s changed from the original application. WWL are taking a head lease over some of the ground floor retail, to ensure that the existing maritime businesses don’t get driven out by market rents, and the rest is general retail: likely to be hospo venues. Hmmm… What about the HPT? Are they AOK with APT at the OPT? Also, speaking from experience, the resteraunts presently at the OPT are very bad – I’m definitely looking forward to their replacements. Ah – the kiwi pastime of bashing the rich. Yawn. It looks exactly like Wellington’s version of Woolloomooloo Bay wharf in Sydney. At least on the exterior. And you think that’s not a popular destination? Maximus – I normally agree with the majority of your postings. This one is very wide of the mark. A very tedious social commentary on waterfront apartment living, those that can afford to live there, and those that can afford to develop it. Sure, you pay lipservice to the development (“On the one hand its a great move for common sense, as well as for Willis Bond and Athfield Architects – and saves the Council a lot of money from having to upgrade the wharf for no return”) but on the other hand you rip it for the type of development that it is. The upgrade for the OPT piles was going to cost the ratepayers $16 million. That’s you and me Maximus (presuming you are a ratepayer). And we would still have a crappy building on top. Nope. Wrong again. Once again, you and me picking up the tab for that. WWL is just the vehicle for our money. Don’t get me started on Waterfront Watch. What good have they ever done? They opposed the design for Waitangi Park (and supported some trashy, flippant scheme dubbed “The Peoples Choice”). They lost that battle and now we have a world class park. The opposed the redevelopment of Herd Street. Lost that one also. A very successful urban area. Witnness it on a sunny Saturday or Sunday. They opposed the development of the Kumototo Precinct. Lost. A wonderful area full of life and people. People having – shock, horror! – fun on the waterfront. They opposed the Hilton on the outer T.
All Waterfront Watch has done is cost us a lot of money for no result. They are a small minded interest group that has a very small base of people that support them. Pauline Swann for a gong? Not your best work Maximus. The OPT is a rusty collection of uninteresting retailers surrounded by an ugly bit of tarseal and parked cars. If someone improves it and it doesn’t cost me any money, then I say they should go for it and I couldn’t care less who lives on the top stories. The architects drawings of the redeveloped terminal look a lot better than what is there now. Waterfront Watch are a miserable group who are opposed to everything that has made the waterfront a fun place to walk, bicycle, rollerblade, drink coffee at, or read a book by. The reforms to the RMA allow this sort of group to have their say, but not to delay progress for years when they’re in a tiny minority. The sooner the reforms are enacted, the better in my opinion. KLK – never been to Woolamaloo, so not sure what it’s like. But I’m happy to believe its popular. Let’s hope the OPT is just as popular a destination as well. Mobsta – thanks for the compliments and the slap down. You’re probably right, its not my best work. I just can’t stand the b s spin machine, and felt that KP needed reminding that we’re not all sheep. But I feel duely slapped, and shall crawl back into my shell to lick my wounds. and here’s an idea: seeing as the Cruise Liners that we have coming to Wellington each summer (i think we had 36 or so last summer? – not sure if that will drop off massively or not with the recession) and they have to tie up next to the log processing yard at CentrePort – full of bromide fumigation, and not that good a look…. …so here’s a question: why doesn’t the City develop somewhere for Cruise Liners to dock? Like, perhaps, the Outer T or the OPT ? I�m with Mobsta on this one. Those who whinge about the unfairness of living on the waterfront can find their way there if they wish to. I live on the waterfront � am I supposed to feel guilty? Renter first and now with a mortgage. Certainly not rich. Pauline Swann may put her heart and soul into what she does but so do I � as I�m sure do many others who support reasonable development on the waterfront. But when she pursues ridiculous appeals that are costly to the ratepayer she is being heartless. What the waterfront needs (and is finally getting) is amenity. Things for people to do � markets, cafes, shops, parks, recreation, toilets. WW would have grass and nothing else. Amenity can be provided by private enterprise (developers and their clients pay) or the council (you and I pay). But the citizens don�t want an increase in rates � and WW has been quick to criticize spending rates at the waterfront in the past. To provide amenity without ratepayer expense we will have to have things that provide a return for developers so they can invest in the infrastructure that maintains and protects the waterfront. This means hotels (nixed), bars and restaurants (think viaduct harbour) or apartments. The latter is the least intrusive and provides the greatest return for the amount of customers. And yet we must hate them because they are exclusive and only the rich can afford them. Again, I�m not rich, but some of the rent I paid and the mortgage I�m paying found its way into the public benefit everyone else enjoys. Of this I am proud, and you should be happy. There are restaurants at the OPT????? Good call on the cruise ships Maximus. I’m sure you’ve noted that Auckland are looking at developing their own Queen’s Wharf into a cruise ship terminal….. and we all know everything is a competition with Auckland. Isn’t the point of the land grab in Auckland for an official “Party Central” ? A gong? Please. What has Waterfront Watch has ever done for Wellington? They say “no” to everything, which is a recipe for stagnation. Their record shows them to be simple obstructionists with no constructive ideas of there own. They’ve cost us (the ratepayer) more money and hurt Wellington far more than any other group I can think of . Waitangi Park comes to mind. Remember how long they dragged that out? Now we have a great public space, but it cost us (the ratepayers) many extra unnecessary dollars to deal with their roadblocks. Why do they deserve a gong for that? If they had their way it would still be a trash heap. Same for the OPT. The OPT is a derelict eye-sore that was going to cost us ratepayers millions of dollars – just to maintain it in its current derelict eye-sore state. Now we’ll have a nice new building and space. It will indeed be a destination and will bring more life to the city. But no thanks to WW, which dragged things out for months with their delaying tactics. Lastly, the fact that some rich people (gasp!) might also live there is hardly a valid argument against the development. Wellington is not Pyongyang. I think I’m being mistaken, by some of you lot, but that’s ok. Please note: I’m not against rich buggers building apartments on the waterfront, although I have a recollection that in some civilised countries in the world, developers are required to provide a certain amount of low cost apartments along with the high cost apartments in the same complex. I kid you not. We don’t have to be this rabidly right wing you know – we never used to be. But I accept that in NZ in the current political climate, pigs are more likely to fly (and with swine flu spreading, perhaps they do), rather than affordable homes be provided anywhere near the water. What I am against is this being disguised as a destination. I stand to be corrected, but I don’t believe it will be – but I hope to be pleasantly surprised to be wrong. To me it seems mainly likely as a place for apartments, and having lived in a few urban centres, I’m pretty sure that I can say that loud bars, noisy late night restaurants, and high cost housing don’t mix. Vancouver waterfront, Baltimore waterfront, London Docklands, San Francisco Pier 49? wherever there are fancy pants done-up waterfronts with lots of late night people, lagered up and shouting, there you do not get high cost housing right above it. ie: when you get high rent apartments with great views, and exclusive underground carparking access, and own your own roof top spa pools etc, – they just don’t sell if there is a Loaded Hog on the ground floor. Of course if you want vitality on the waterfront, have poverty stricken students living above the pub on the waterfront. That’ll be a lot more noisy and vivacious. Let’s face it: the nameless, faceless, blank and bland face of the old Odlins building is dead to the world cos of the crusty old rich fogeys living there. They add nothing to the waterfront at all – for a start they’re hardly there as they are always off on business, and they don’t throw noisy parties for the rest of us – in fact, i think, the ground floor is still empty. And lastly, the Gong for the Pyong Nong. Look – don’t get me wrong – well, maybe you do – but anyway – I do partly see my role is to wind you up occasionally – but my point was, architects and developers and contractors and fire engineers never get gongs. But kindy teachers do, and sports people do, and struggling little kiwi battlers do. Especially if they go on and on for years. I’d rather take the entire crew of Waterfront Watch down to the waterfront and set fire to them on guy fawkes night, but that’s just me. I think a lot of the public will be saying “Yeah, right on, you go girl” etc etc etc. I say maroon them somewhere like Orange County, CA., or Upper Hutt, and they might just appreciate the finer points of urbanism. Seriously though, they are but a subset of what I’ve termed the “Quarter Acre Cartel”. – shoebox developers, who probably live in McMansions and have little concept of actual urban living. I was tempted to throw in council bureaucrats, but they by and large merely reflect the attitudes of the above cartellists. 1) Go on a human cull, Ted Kaczynski style. Option 1 would have its practitioners on the next plane to The Hague, for all the wrong reasons. Option 2 – Auckland has gone down that path, needs no explanation. Option 3 – will piss off more than a few people, but the best of a bad (?) lot. Done right, it’ll follow in Vancouver’s footsteps. Done wrong, it’ll go the way of Auckland’s shoeboxes. Wow it really is eat the rich week! The thing that Vancouver, Baltimore, London and San Fran have that we lack is population. Loud noisy bars and restaurants might be great at the OPT but to pay the $32m (that Willis Bond are for the development rights), a beer will set you back $120 and a cocktail three times that. If however, we (the people of Wellington) think making the OPT a destination must exclude (revenue generating) apartments then we (the people) must be prepared to subsidise it through our rates. Somehow I don�t think we�re ready for a 15-20% rates rise just so we can keep the rich off the waterfront. Maximus I fully endorse the concept of the developers of high -cost apartments being obliged to provide low-cost apartments. However, this has worked best where the low-cost doesn�t have to sit side by side with the high cost. Call this snobbery but it is simple economics � if the buyers of the high cost apartments are essentially subsidizing the low-cost apartments they will be looking for value. I also don�t get why we need council flats on the waterfront. To make us feel virtuous? Should we insist on low cost housing in Roseneath or Khandallah every time someone builds a townhouse? This isn�t urban planning but social engineering. My household income is close to the city�s average and I can live on the waterfront (although not in Odlins). There are several apartments in my building rented by students. Their presence hasn�t changed the building at all � unless you count the eight people and a rabbit living in the two bedroom down the hall. I haven�t been to Odlins lately but his proves nothing. I certainly wouldn�t go there if it was occupied solely by students hanging their washing and banners out the windows. Perhaps you avoid going to parts of town simply because rich people live nearby but I don�t. This is not �rabidly right wing�. Just good economic sense. If you have a good idea about how to come up with $20m (the repiling cost) so that we can plant the OPT in grass to make it a �destination� tell us what it is. The Odlins Building was never touted as a “destination”. Just because it has apartments on the top doesn’t make it a destination. Ironically the buildings that bookmark Odlins (Mac’s Brewery and St Johns) were designed as destinations and both are. You’re mixing your arguments Maximus. You seem to have ‘destinations’ and ‘apartments’ mixed up. I know that Kerry said that OPT was going to be a “destination”, but that just sounds like spin to me. Rail against the spin Maximus, just don’t disguise it as a social commentary on housing. I imagine that the demand for waterfront living would make any low-cost housing impossible to achieve in an open market – unless you build sub-standard dwellings (surely you are not advocating that?). Well said M-D (x2). I am interested in low-cost housing (perhaps you feel a post coming on Maximus?) but I wonder what the best model is and who should provide it. Government �both central and local � has been vexed by it for years. The WCC is already the second biggest provider of low cost housing in the country after the government � should they provide more?. When it�s left to developers (or, worse, required of them) the results are not good. Witness the shoebox slums of central Auckland built for a disappearing international student market and funded by na�ve Moms and Pops everywhere. The reality is that there is, sadly, little commitment to low cost housing on the part of government, landlords and also tenants, who are frequently transient and have a consequent lack of respect for property. I�m not making a judgment here, merely observing that cheap accommodation while not necessarily nasty to begin with can end up looking so pretty quickly. I am perhaps more interested in affordable housing rather than low-cost (with all its connotations). By which I mean ways to get people with little initial resources into houses that they have a stake in � either through sweat equity or assisted deposits. Such a scheme is unlikely to be brand new apartments (on the waterfront or anywhere) but one that takes advantage of existing stock that is undervalued, by the market and/or local government. Banks could have a role to play through mortgagee sales. Just as I thought. The bureaucracy is commonly scapegoated when shoeboxes and museumified localities emerge, but it’s tantamount to shooting the messenger. Remember the Hobsonville Air Base proposal for affordable housing? That effectively got shot down by the blue-rinse portion of the QAC. It a great spot to walk around, is a mix of great restaurants and apartments, its very popular on a nice day….about the only downside is Russell Crowe lives in the penthouse on its point. “I wonder how far Wellington Mayor Kerry Prendergast will go in celebrating being “absolutely delighted” with yet another gift to developers. At a rough guess, a piecart operator will be paying far more for a short-term land lease than an apartment owner will be paying at the Overseas Passenger Terminal site long before the lease deal expires in 125 years’ time. 2200 affordable homes is a pretty good result. It would be interesting to know more about them, including, where they were. I believe that the modernist high-density blocks (e.g. Newtown) are a product of Porter’s time. Incidentally, although I can find no mention of it anywhere online, the Athfield designed tower block that is part of the Arlington flats complex, is (or perhaps was) named after Porter – the George Porter Towers (or something to that effect), in virtue of his contribution to social housing in the city. He refers us on to a fantastic floating design by French Architect Vincent Callebaut, who has this http://vincent.callebaut.org/page1-img-lilypad.html website worth looking at. Thanks for the links Byron. Mind you, that Richard MacLean geezer, the Council PR guru, has been very quiet on this one. I was sure he’d be leaping in to defend the mayor’s honour against the comments I so rudely made. I write in response to Pauline Swann of Waterfront Watch (Letters, June 23). She proudly states that the group has campaigned “for a decade to protect teh Wellington Waterfront”. This is code for “we have opposed every initiative proposed for the waterfront in the past 10 years”. The waterfront has been transformed from an absolute disgrace to an awesome spot, despite every initiative being opposed by various “community groups”. Thank God we’ve not listened to the various “I’m opposed to everything” groups. absolutely. Thanks for that one mobsta. I love the Wellington Waterfront and think it’s coming along well. It was good to see the DomPost article in the weekend too. “Waterfront Watch has not been opposed to development of Wellington’s Overseas Passenger Terminal but the current plan fails to preserve the remaining natural character of the coastal environment and to protect the historic heritage value of the site. It is one of Wellington Harbour’s most conspicuous buildings and an iconic site. We’d like to see it restored, because it’s a beautiful venue and should continue to be used as a function centre, berthage for fishing, naval and other small vessels, and we’d like the retention on the ground floor of all the marina facilities, such as sail making and boat repairs. We consider that the proposed replacement apartment building is too big for the site, will intrude into three view shafts and cause shading and loss of sunlight on public spaces at the southern end and an increase in traffic, with consequent safety issues for promenade users. Waterfront Watch has been campaigning for more than a decade to protect the Wellington waterfront, which we believe is a community asset as unique and valuable as the Town Belt. and another view. Hope the Dom doesn’t object to me posting these here, but there is no way to keep a thread going on the Dom site. So here are all the issues here…. I’m not sure how people such as Peter Henderson form their views, but, sadly, his opinion about the Overseas Passenger Terminal appears similar to that of many Wellingtonians. What they fail to appreciate or acknowledge is the need for occupation and surveillance that comes with development such as apartments and commercial use on the waterfront, so that there is shelter, and people feel safe and want to go to there. The development of the Odlins Building, the brewery, the Free Ambulance Building, and Herd Street Post Office as commercial spaces is testament to this. Mr Henderson also ignores the fact that, as for the entire waterfront, all ground-floor spaces must have a public use. In my view, Wellington Mayor Kerry Prendergast is perfectly entitled, as is all of Wellington, to be delighted that the OPT will get a structural overhaul at no cost to ratepayers, and that another new and exciting Athfield destination point will be created on the waterfront. Do people really want wide open, windy spaces or rotten old structures there? Well done to architect Ian Athfield and developer Willis Bond. Hi Maximus – I was interested to see that you have lifted Shona Bradley’s letter in response to my letter to the DomPost. She must have been pretty taken in by the spin of the Mayor and her fellow travellers that she can presume to know my opinions. 1. How come we now need unpaid residential police to protect the waterfront when it has not been necessary until now? 2. What is going to make the OPT a destination point when it is primarily a residential apartment block,? 3. Won’t more buildings on the waterfront create wind tunnels? 4. Over the 125 years of the OPT lease, is it feasible to assert there will be no cost to ratepayers? For example, who will pay for wharf repairs and the next re-piling job? 6. What active recreation in the ground floors of buildings will replace a stroll around the waterfront with unimpeded harbour views and no high buildings? 7. 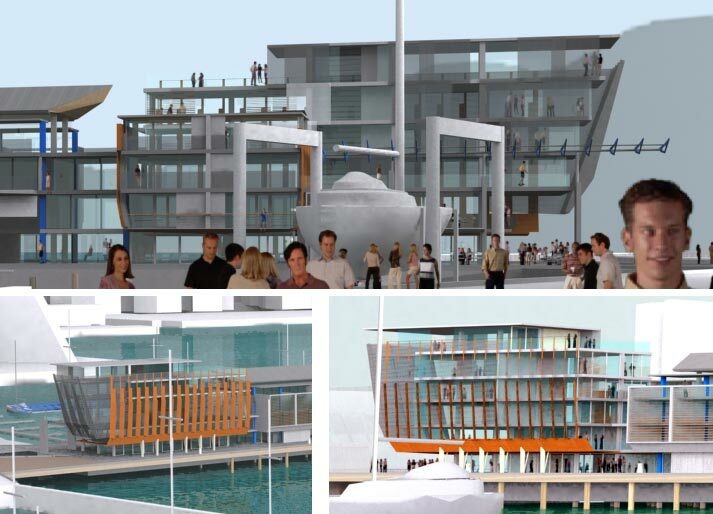 Do Wellingtonians want to risk more monumental blunders like the Queen’s wharf development? When I wrote to the DomPost, I was in Barcelona and able to stroll around the waterfront for hours without having to suffer the oppressive presence of high buildings. It is amazing what a true international port city can achieve when developers are kept in their place and planning primarily accommodates people instead of buildings. Great to get your questions on the blog. That’s what this forum is for – to get opinions and foster debate on architecture and urban issues in Wellington. 1) Unpaid residential police? What are these and what do they do? I have never heard of these before. Can you elaborate on these? 2) I think the ‘destination’ quote from the mayor was purely spin. This has been discussed above. No one really believes it’s going to be any more of a destination than what is there currently. 3) All buildings on the waterfront, and in fact all new buildings over a certain height in Wellington, are subject to a wind tunnel testing. If they have adverse wind effects they are not given permission to go ahead, or they have to be redesigned so that they have “positive” effects. I suspect that wind is a bit of a red herring when it comes to buildings on the waterfront. 4) Not sure. You may have a point here. It will come down to the terms of the lease and what is defined as the public areas of the OPT. I would suggest that the WCC would not want to be liable to repairs to what is essentially “private property”. 5. What happened to 5? 6. What is different from the current building to the new design? There is currently ground floor activity (restaurants, maritime retailers etc) and these will be in place in the new scheme. The public at present can walk all around the OPT and this will continue to be the case. As Honeywood commented above “What the waterfront needs (and is finally getting) is amenity. Things for people to do � markets, cafes, shops, parks, recreation, toilets….” This is what makes our waterfront vibrant. Not green grass. 7. We now have insurance against developments like Queens Wharf. That is ancient history. We now have a zero height limit on the waterfront, so that all developments have to be notified. We also now have the TAG advisory group assisting the Council on design issues, which include design, and bulk & location. To mention the Queens Wharf development in this context is scaremongering. I hope these answers provide some food for thought. I’m not sure that there is really any basis for your concerns once they are thought through. Mobsta, I’m a bit surprised you responded to a ‘curmudgeon’ – pleased to see debate rates alongside name calling in your list of priorities. The ‘unpaid residential police’ refers to Shona Bradley’s comment in her letter that was lifted from the DomPost (above). I seem to recall that pandering to the fear factor was also part of the Mayor’s disinformation campaign in support of gifting the waterfront to developers. It is a sad commentary on city governance when spin displaces constructive debate when it is critical that discussion should focus on the best options for the long term future of the city. I have to admit that the existing OPT has not been one of my destinations � always avoid it. I suspect from an earlier comment on this thread that my ignorance of the facilities that are available there is not unique. This seems to raise the question of whether more of the same is necessary, desirable or become a destination. I have a suspicion that there will be a stream of failed businesses once the novelty of the ‘new’ OPT building wears off. From my observations of the turnover of cafes, bars and other service provider establishments when living in Auckland, the 100 day honeymoon period applies to more than just politics. I have been told there is one exception but good taste stops me from going too far down that route, other than to point out that plenty of rooms will be available when the OPT development is competed. If we were only talking about the OPT, I could possibly be persuaded that the impact of commercial and residential development at the waterfront may not be too great, since we are already stuck with the 1960’s blunder. However, this is obviously not the end of the story. We have the new BNZ, Meridian, three more buildings at Kumutoto Precinct, another contribution to Paris Hilton’s inheritance and goodness knows what other multi-storey edifices threatening one of Wellington’s best attributes. Unfortunately, Queen’s Wharf isn’t ancient history as Wellington is destined to live with it for many more years to come. This, along with other failures (OPT Mk1) prove that long term planning errors are likely to persist despite the best of intentions and lessons that were supposed to have been learned. You refer to TAG – is this the group that puts the lipstick on the pigs? There is also no reason for confidence in the protection provided by the zero height limit. As you well know, the Council is planning to do away with this and will persist through the appeals process, no matter what it costs the ratepayers. Finally, one has to question Honeywood’s comment about amenity: ‘Things for people to do � markets, cafes, shops, parks, recreation, toilets�.� This is what makes our waterfront vibrant.’ Do people have to be endlessly entertained an warm fuzzied to attain vibrancy? As the amenities he lists are readily available within a short walk of the waterfront, why duplicate them. The only difference would be the nature of the backdrop – a short-lived attribute if the company is stimulating. The waterfront will be better served if it is a space that people can enjoy for its non-commercial and aesthetic attributes, especially on Wellington�s many good days. An open environment will have an increasing significance as more people migrate from the suburbs to live in city apartments as prices become more realistic. This lesson should be learned from the international port cities that invest heavily in reviving their waterfronts by developing people scaled open space environments. Hang on! Didn�t planners successfully go down the open space environmental architecture route in Wellington before the ‘international city’ aspirant ethos emerged. Pity the Council didn�t learn from that one. Peter, you’re sounding more curmudgeonly by the minute. Goodness me, that’s a provocative statement – lucky for you i was away from my fishfarm for a few days or I would have leapt into action earlier. “Multi-storey edifices”? “Warm fuzzies”? Where to start? We’ve been having this conversation for a number of years now, either here at the Fish, or some excellent dialogue previously on the WellUrban blogsite. I think that you’re wrong here, or being deliberately provocative. The waterfront in Wellington isn’t being destroyed, it is being gradually and continually improved. I think most people of sane and rationale mind would agree with that, possibly Pauline Swann excluded. It is a slow and careful process entirely because there are a lot of people who care very much about the waterfront, and the steps taken are deliberate and one at a time. I’ve a lot of faith in the structures in place at present along the waterfront to make it all work together. At present the entire area has a height limit of zero metres before triggering a Resource Consent requirement – and this ensures that the Tag team are brought into play. They carefully and very fully vet the proposals being put forward. Consequently the proposals for the waterfront get a far higher level of scrutiny than do similar proposals anywhere else in the city. I reckon its in good hands. Hands that, in part at least, are acting for the people of Wellington. And its Our waterfront, so its well deserved that its well looked after. but I should also say – don’t get me wrong – you be as curmudgeonly as you like. Fire away. Just watch out for your own feet. Ahhh- time to go back to Barcelona where they don’t play me-too with Auckland when it comes to waterfront development. Peter, I was going to say “If the cap fits….” but then Maximus beat me to it. Unfortunately I see you have reverted back to form. Your ignorance of the facilities that are on the OPT is not unique. Most of the retail elements that are there are of a specialised nature i.e maritime maintenance and boat sales, chandlers and the like. It is not a destination for the common man (person). However what I do think is pleasant (on a nice day) is a walk around the skirt of the OPT itself. On a good Wellington day you will encounter fishermen, strollers, people walking hand in hand. This will not change with the new scheme. Your comment about a stream of failed businesses and failed bars and cafes smacks of being a curmudgeon. Not all businesses fail. Most of the businesses that are in the OPT have successfully thrived for a number of years. And you may have trouble believing this but people go to restaurants and cafes on the waterfront because THEY ARE ON THE WATERFRONT. It is a genuinely nice place to be. Your comment “As the amenities he lists are readily available within a short walk of the waterfront, why duplicate them. ?” is beyond belief. Witness the bars and cafes that are on the waterfront at present and see how popular they are. They are a destination (a much touted word on this thread) and people want to go to them. It doesn’t matter that there are bars and cafes on Courtenay Place, or Cuba Street, or wherever. It is not a duplication, it is different and it is change. Something it seems you are scared of. You misunderstood my comment about Queens Wharf. I was referring to the PROCESS of getting Queens Wharf built. Yes, it was a mistake. Yes it is too big. Yes we are stuck with it, but I stand by my comments that will not be repeated again. There are too many checks and balances in the system now for that to happen. Unfortunately your fellow curmudgeons on Waterfront Watch appeal and appeal thus tying up these worthwhile projects for years only to be proved wrong at the last hurdle time and time again. (It’s worth repeating: Don�t get me started on Waterfront Watch. What good have they ever done? They opposed the design for Waitangi Park (and supported some trashy, flippant scheme dubbed �The Peoples Choice�). They lost that battle and now we have a world class park. They opposed the redevelopment of Herd Street. Lost that one also. A very successful urban area. Witnness it on a sunny Saturday or Sunday. They opposed the development of the Kumototo Precinct. You also denigrate the (voluntary) role that TAG has. “Lipstick on a pig”. Only to Waterfront Watch and their cult-like followers. They do a fine job reviewing any projects that affect public amenity. They were even tasked to review the redesign for Frank Kitts Park (hardly a building involved and hardly a “pig”). Don’t even get me started about the buildings that you list that have been built. There very buildings which have put people on the waterfront and contributed to the vibrancy and life of the city, even on bad days. Wellington does deserve a world class waterfront. And that is what we are getting thanks to the regulatory processes in place, volunteers like TAG, developers who value good design, people with a vision of how a waterfront should work, and consultants like Jan Gehl who believe in the vibrancy of the city through mixed use. Wellington has always led the way with the development of the waterfront . Auckland are miles behind and struggling to catch up. They look at our parks (Frank Kitts and Waitangi Park) with green eyes. They look at the access that we have to all parts of the waterfront (from Oriental Bay to the Railway Station) with wonder. You have it around the wrong way. They are the oness playing me-to. *In the central city area, our restrictive red fence has been taken down – whereas Auckland’s has been kept up. *Our Port company has moved sideways – and ownership has passed over – Auckland’s has not. *Our harbour edge is in the hands – not of the Council, but of a dedicated group of people who know and understand what they need to do. They employ top notch architects like Athfields, Studio Pacific, and the best Landscape Architects like Wraight and Isthmus and Boffa Miskell. *They allow and encourage and carefully vet all applicants for new developments and retail operators. I believe they are trying to get a good mix of activity uses down on the waterfront. *Our harbour edge shape means that the harbour edge is the shortest distance between 2 points, and so therefore a very desirable pedestrian route – Auckland’s is in a straight line, but with no particular reason to get from a point at one end, to a point at the other end. Therefore, sadly, to a certain extent, whatever Auckland tries to do on the outer parts of their wharves, they are doomed to failure. That’s why Auckland’s Viaduct is such a popular place, and their Queens Wharf is such a potentially awkward idea. Hi guys � I note that debate has turned into slagging, pontificating and name calling so I guess its time for a last contribution. I see you both, Mobsta and Maximus, went for the Wellington/Auckland stuff and avoided the Barcelona bait. Wondering why? As for comparisons between Auckland, a city I never got to like despite nine years of trying to come to terms with it, and Wellington, there are a few �me too� bits. Try apartments on Princes Wharf and a Hilton in pride of place at the end of the pier. Add in a bit of vibrant Viaduct Basin which caterers for a relatively limited demographic which from memory has a great view of a reclaimed cesspit and virtually no harbour views. Last time I was there, it seemed to me that it had a preponderance of 30 something mummy�s boys who still bludged off their parents, talked big and seemed spectacularly unsuccessful in their aim of pulling birds. Actually, to give the Viaduct Basin its due, it seems to have much larger pedestrian areas than the Wellington waterfront. Next, add in the ferry terminal area that is largely swamped by high buildings – Bluebridge/BNZ. It remains to be seen what becomes of Auckland�s Queens Wharf as it is still a pretty blank canvas from what I can gather. I also don�t recall that tourists are dropped off next to a log pile up there. Is this is on the plans too, if they follow Wellington�s leads. Can�t work out how Waitangi Park rates as a waterfront site Mobsta � last time I looked, the extended footprint of the Herd Street Post Office development blocks almost the last vestiges of harbour view. A bit like if I had claimed that Courtenay Place precinct was on the waterfront rather than a short stroll away. Interested in the recommendation of Boffa Miskell. Sorry, my experience leads me to a more cynical view after researching their part in a few district plan change applications and seeing them in action on one occasion. You are a mine of information though Maximus. Who is paying Jan Gehl�s consultancy fees? From a quick look at his work, I can�t see too much difference between his concepts and the way I might envisage the Wellington waterfront, which tends toward a people centred and scaled environment. Actually, I can see how his concepts possibly informed the work on Barcelona�s waterfront. On that count, I was interested to read that that city had turned its back on the built out waterfront, initiating the massive works undertaken from, I think the early 1980�s, to bring it back to life. I recall that was Wellington’s past and fear it could be the future as well if developers have their way. I have to agree with you Maximus when you comment on the natural advantages Wellington Harbour affords. Let�s hope that some of the natural part survives. Finally, keep up the good work with Eye of the Fish – always worth a read. Barclona? years since i’ve been there – but I don’t remember the waterfront being the best part of the city. Las Ramblas, on the other hand, is great. Comfortable, wide, pedestrian street. From memory, the waterfront was cut off by a nasty waterfront road wasn’t it? Maybe it has changed. Not sure what your point is. Jan Gehl? nice bloke, well respected, doing work all over the world. In Wellington he was paid as a consultant to come and advise and undertake a report. The report is very slowly, very quietly, being implemented. Waitangi Park? The Herd St Post Office has always been there – I don’t think you can blame the council for that. At the time of its redevelopment there were a number of schemes that looked to move it away, turn it around, demolish it, etc, but in the end it was left where it is. It has a number of advantages: it shields the park to a small degree from wind, it creates a slightly more enclosed arena, creates a cool pool of shade in summer, and it helps define the harbour edge. It still has more disadvantages – shades the park in winter, makes the wind worse in certain conditions, is not really open to any degree to the public as it should be (top floor lookout deck – hah!) but regardless: it’s there. And lastly: Waterfront Watch. If you’ve listened to them at public meetings, Pauline and Lindsay are quite open about their dislike of buildings on the waterfront. Its a perfectly valid concern (although one that I disagree with) : that Wellington has enough buildings, and that the waterfront should not be built on any more. They don’t seem to get the concept that people go to the waterfront because there are nice places to be and to sit while you are there. It is far more popular now than it was before Wellington Waterfront started its tweaking. But you’ll never convince Swann et al of that. Anyway: time to move on. I must work on a new post! I wonder what on…. of course Waitangi Park is part of the waterfront. Look at the District Plan. Look at the masterplan for the waterfront. Look at how the planted out graving dock touches the harbour. Look at how the park encompasses Herd Street. It seems to me that using over-the-top generalisations and suppositions isn’t helping your argument any…. it just comes across as bitter and twisted…. I have a friend who lives in the Barceloneta. We stay with him whenever we go to Spain. He lives on the waterfront in a 7 story apartment building, it is old and fading with peeled paint. Beautiful and full of character. The building that he lives in is taller than the current OPT, the proposed OPT, and possibly the Meridian Building. His building is not uncommon. The area that he lives is filled with cafe’s and bars and small businesses that add to the vitality of the area. People live, eat, work and play in these areas. It has the density to achieve this. (Barcelona has a staggering 15,000 people per square kilometre, compared to our 860…). A lot of the waterfront area in Barclelona was completed by the National government in time for the 1992 Olympics. We, unfortunately, do not have the same luxury of an Olympic sized stimulus package, and so our work must be completed in small parts by the Council and larger parts by private developers. Maximus makes a point when they state that there are also other interesting parts of Barcelona (Las Ramblas, the old quarter, the Sagrada Familia, Parc Guell, Montjuic Park, and Placa Catalunya amongst others. Wellington is no different in that we have interesting bits as well, but obviously our good bits have a different character to a truly international city such as Barcelona. Barcelona’s waterfront is also assisted by having 1.6 million people on their doorstep compared to our 190,000. I think we are doing rather well with what we have completed already and what is proposed. Another area that we differ from Barcelona is their love of good design. The architect is revered in Spain. In fact it is compulsory that an architect is involved in every building project. Compare that to our distrust of good design and how great architecture can contribute to the cityscape. Comparing Wellington and Barcelona is a bit of a stretch. We have different cultures, different populations, different climate, and probably most telling of all – a different mindset when it comes to good design and architecture. I’m not sure where in Barcelona you friend lives Mobsta – I’m envious but economically, there is no way I can move there. My point is not about Barcelona generally though I agree wholehearedly with everything you and Maximus have written. Focusing solely on the waterfront, the redesign was managed in such a way that when there, one can be oblivious of the necessarily tall apartment buildings when at the bottom of La Ramblas, around Port Vell and Barcelonetta, or as one progresses up the coast. I have no particular expertise, but it seems to me this has been achieved in a number of ways which started, as I understand, by reclaiming a total of four hectares. The main roads, which like elsewhere in Barcelona seem to have their lights phased to advantage pedestrians, provide separation in some parts. Elsewhere, the separation is achieved with wide pavements, promenades, and single story ground floor protrusions with expansive areas between their outer edges and the curbs. Another impressive touch is the large restaurants and bars that sit under the road and wide pavement (Playa Passieg Martin) with outdoor areas on the beach with a wide promenade for passing wanderers. There are changes of inclines, paving changes, grassed areas and landscaped planting thrown into the mix so that the overall psychological effect is of open spaces and water without the impression of buildings taking away the human scale. I doubt if climate is necessarily an ingredient (wind excepted) as Jan Gehl’s concepts work in Scandinavia and Barcelona gets down to eight degrees in winter. You said (Mobsta),”The area that he (your friend) lives is filled with cafe�s and bars and small businesses that add to the vitality of the area.” I think you would probably agree that the same is true of most parts of Barcelona. It was particularly so of Gracia where I had the good fortune to live for over four months. I think the points here are that these businesses are not primarily there because of the waterfront and for most Barcelonans, they are not a prime attraction as some seem to suggest cafes and bars should/would be on the Wellington waterfront. As the Mayor said, the sky didn’t fall down when the Meridian was built but an avalanche only takes one snowball to set it on its way. I am envious of you living in Barcelona for four months. It is a fantastic city. One of my university lecturers is the chief architect for the Sagrada Familia so I have had a couple of great looks around. You are correct about the scale of the city and of the open areas of Barcelona. They have certainly done them well. I think your analysis of this is spot on. You are also correct that the businesses and cafes exist not because they are “destinations” but because they are… there. They exist due to the density of Barcelona. I too like the buffer that Frank Kitts and Te Papa and the like create for the harbours edge. Although I would like a greater interaction between the city and the harbours edge. This is why I think that the “greening of the quays” is a step towards bringing the city and the edge closer together. Unfortunately we have a six lane highway separating them. Jan Gehl proposed reducing this to 4 lanes (or less), but due to the impracticality of this it meant taking other measures. The “greening of the quays” was the first step in this process. I think that we both agree that the harbour’s edge should be a fantastic place to go and be and just hang out. Although you may want to go and sit and look and I may want to go and sit and eat and drink… We both think it should be humanist in scale and for the people. We just have different views on how to get there. It seems to me that a start point is to get away from thinking that we need to have developers putting up places to live, work and stay as a means of financing the recreational enjoyment of the waterfront. This type of investment is a brutal tool as in the end, medium or high rise accommodation and ‘active’ recreational usage become pretty much mutually exclusive. In time, as the population increases and attitudes to city living change, most of the current commercial space along the quays will probably convert to residential use anyway, especially if harbour views are retained. A large part of the linking of a city and the waterfront is psychological and influenced by view. Sort of – if you can see the destination, you are more likely to feel attached and get there. An issue here is that increasingly as one passes from Aotea Quay to Oriental Bay there is less evidence of a working wharf, recreational areas and a harbour. Harking back to Barcelona for a moment, they have up to eight lanes of traffic separation (some partially undergrounded) but the city and the waterfront still somehow feel connected. I think this is because of the views (not just viewshafts) of the waterfront. These views are also encouraged by the siting of parks on the city side. Sort of like larger well developed and maintained Illot’s Parks with harbour views. In retrospect, it would have been great if the old Post Office and Hope Gibbon’s sites had been used by earlier councils for landscaped parks and, of course, Queen’s Wharf had been built down instead of up. If only creative long term planning had been done 50+ years ahead, as we need to do now. Part of the thinking should involve a future that makes fewer concessions to private transport and could include underground or light rail transport that has linkages between the city and the harbour. Obviously the cost will be high but dreams don’t have to be materialised immediately – there is a city of the future to plan for. ps: I prefer to stroll instead of sit and I have been known to stop in for a drink and weekend brunch. absolutely – we need to plan ahead now for the future possible / likely public transport in Wellington. Something I hope they (those in Control) are doing now. Actually, I think they are, already, just about to ask us all. Co-ordinated reply due! BCN is the wrong model for Wellington. For one thing the weather is completely different – BCN is consistently 10 degrees hotter year round and therefore their beach-focused redesign (and yes, it is mostly beach focused – it turned wharves into beaches) is completely inappropriate for a maritime climate. Wellington cannot rely on the sun to draw people down to the water. It has the weather for it only two months a year, and the water is almost unswimmable. In summer, in Barcelona people head to the waterfront to sunbathe, and yes to get away from the oppressiveness of the boxed in city. Barcelona is an oppressive, closed in city with few parks. Wellington is not. In winter the waterfront is much, much quieter and in my opinion much of it is not so successful, especially the hulking civic spaces such as Parc Del Forum. It’s empty 95 percent of the time.